Snowbasin Joins Breckenridge Ski Resort and Mount Snow Ski Resort for Tour’s Second Season Burr Ridge, Ill. – July 13, 2009 – The Winter Dew Tour, the world’s premier season-long winter action sports tour, today announced the host resorts and dates for the three stops of the 2009-10 season. 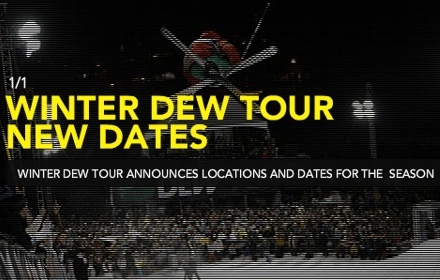 The Winter Dew Tour showcases the top winter athletes from around the world competing in freeskiing (slopestyle and superpipe) and snowboarding (slopestyle and superpipe) for both men and women. The Tour begins at Breckenridge Ski Resort in Breckenridge, Colo., Dec. 18-20, 2009, continues at new host resort, Snowbasin, in Huntsville, Utah, Jan. 15-17, 2010 and concludes at Mount Snow Resort in West Dover, Vt., Feb. 5-7, 2010. All three stops of the Winter Dew Tour will be televised Live on NBC and simulcast around the world on Eurosport 2, Extreme Channel and Fox Sports Australia, with additional coverage on USA Network and MTV2. Dec. 18-20 Breckenridge Ski Resort – Breckenridge, Colo.
Feb. 5-7 Mount Snow Resort – West Dover, Vt.